The unique programme was part of a set of activities that were organised as part of World Sight Day. THIRUVANANTHAPURAM: Sahadulla S ran his fingers along the length of the leaf and then tried chewing it. The bitter taste got to him and the sixth standard student eagerly whispered to his friends, “It is Neem!”. The air was laden with the hypnotic aroma of Neem, Tulsi, Panikoorka (Indian Borage) and several other aromatic trees. The students who were divided into groups of eight took turns to take a whiff of the leaves while some tried chewing it. The visually impaired children were trying to decipher the name of the trees through the leaves. The wilderness was being introduced in a unique way to the visually impaired students. The unique programme was part of a set of activities that were organised as part of World Sight Day. The activity oriented nature education camp was organised by the social forestry wing of the forest department for the students of the Government School for the Visually Impaired. The figurines of wild animals, leaves of aromatic trees, and recorded sounds of the wild animals were used in the education programme. “The students from these schools are mostly side-lined and these are our attempts at reaching out to them and bringing them into the mainstream. We are trying to check their awareness about bio-diversity and nature and see if they get to identify the animals. 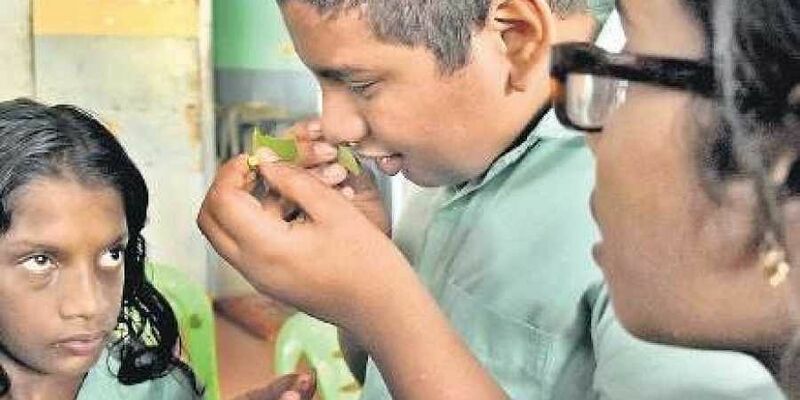 The idea is to make students use the senses of touch, smell, and sound and help them identify the objects,” said J R Ani, Assistant Conservator of Forest, Social Forestry Department.The students of the forestry club of the Christ Nagar Central School were also present. The figurines of wild animals such as the lion, tiger, elephant, bear and hippopotamus were given to the children for identification. Leaves of ten varieties of trees were also brought for identification. "For them, picture books don't mean a thing. The best way to learn is through experience. Ideas can be conveyed better through activities. Unlike learning through hearing, this is extremely helpful, " says Abdul Hakeem K M, headmaster of the school.